On 2nd May 2012, Spink sold “The Adriano Landini Collection of Fine Covers of the World”, including a few covers of interest to the Jubilee collector. Lot 21 was my favourite lot of the sale, and featured the rare “Express D’Orient” label on cover with the 1887 2 1/2d purple on blue, sent registered from Constantinople to Denmark. It sold for £1’000 plus 20% commission. The red label was used to pay the supplementary fee for passage on the Orient Express. Lot 24 was a rare and attractive (although faulty) cover from Mafeking. It beat its estimate of £700-900 to fetch £1’200 plus commission. Lot 44 was an attractive paquebot cover that is definitely of more interest to penny lilac collectors, but I felt it was attractive enough to feature here. 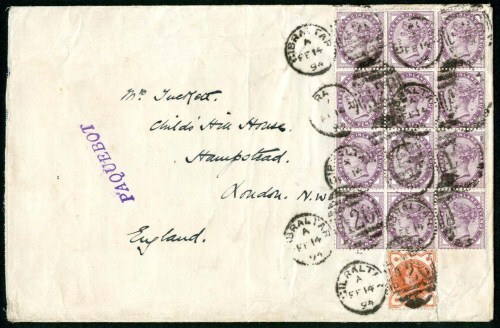 The cover was sent from Gibraltar to England and bears a block of 12 1881 1d lilacs and a 1/2d vermilion. It sold for £190 plus commission. Funnily enough the same price it sold for in the Lord Cornwallis collection sold by Grosvenor in March 2011. Lot 62 was a Jubilee cover going to Tonga! Although it is the only Jubilee cover that I have recorded going to this destination, the estimate of £300-400 was too strong and it went unsold.